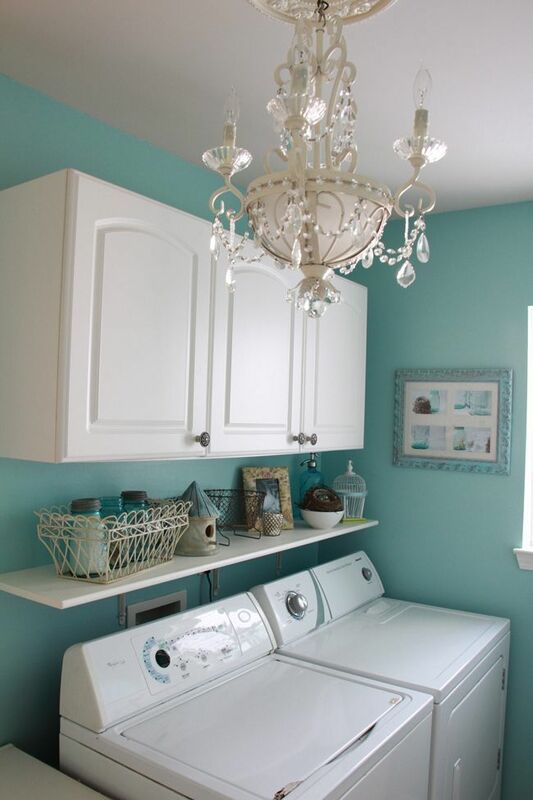 Laundry rooms have gone quite glamourous lately. Have you seen? Chandeliers and beautiful glass containers and artwork. And really, why not? 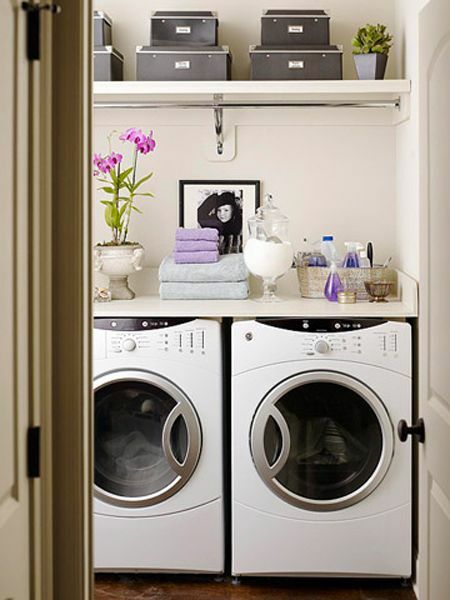 Most of us spend enough time in our laundry rooms that they should be nice to look at. So pretty! 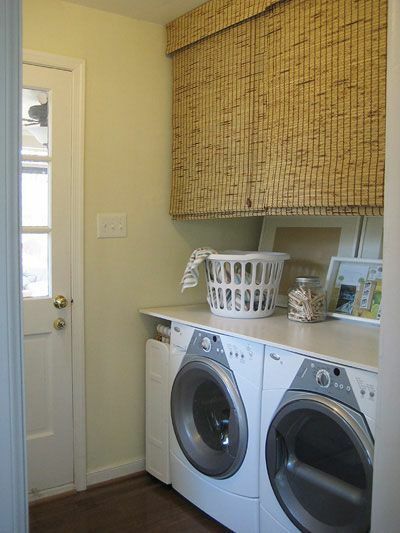 Wouldn’t you love to wash, dry, fold, repeat in this laundry room? 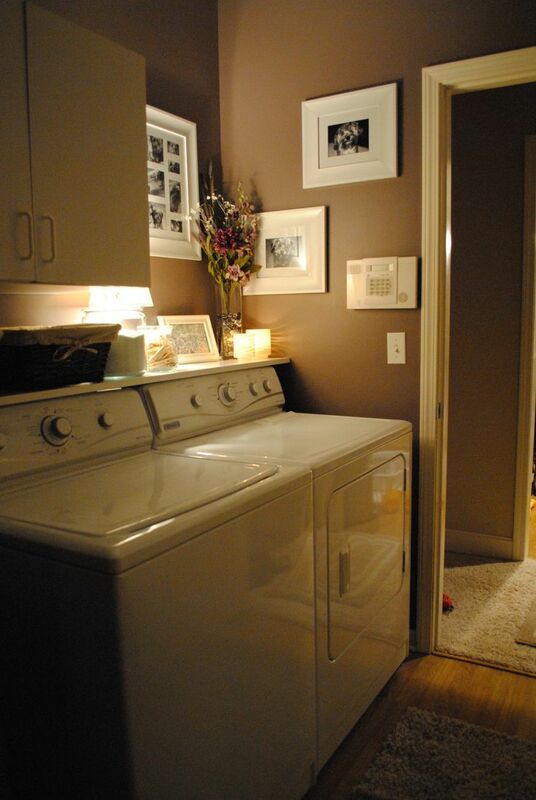 The dark washer and dryer sets a different tone in this laundry room. This one is fit for a princess with its sparkly chandelier and Tiffany box blue. 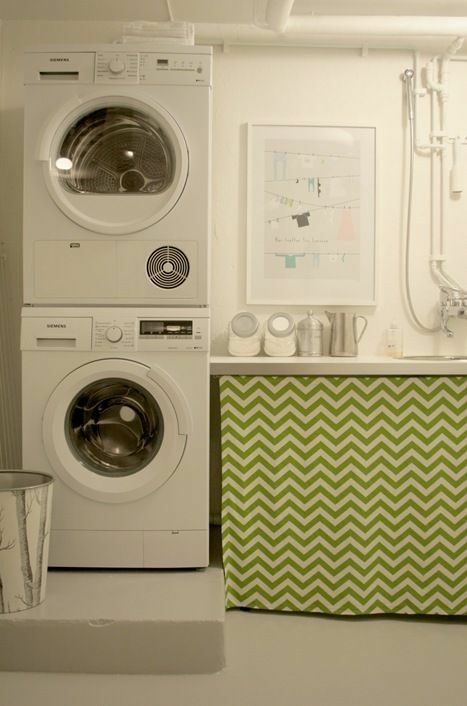 You have to see the amazing transformation of the laundry room below at Chez Larsson. A great example of what can be done with a can or two of white paint. 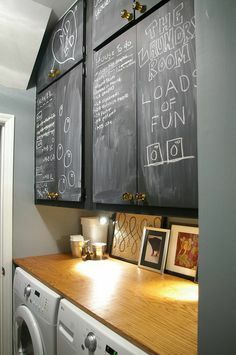 I love these chalkboard painted cabinets and the warmth of the wood countertop. And in that same laundry room, the cleverly painted stripe of white with lots of hooks. 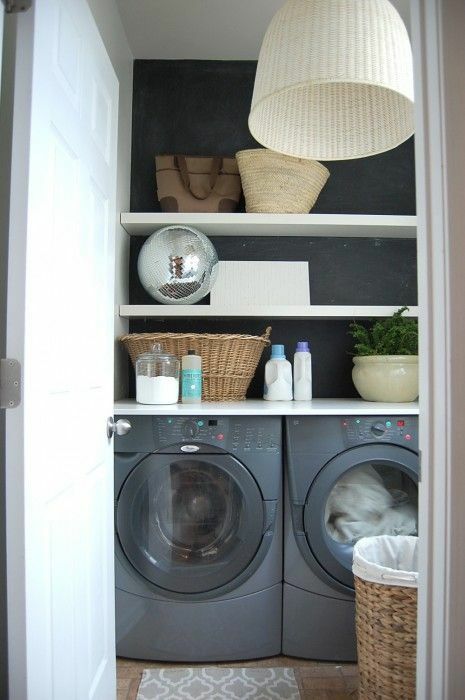 The above laundry room gets an A+ for beautification on a budget. The floor was retiled, but other than that it’s all paint and a piece of plywood from Lowe’s for a countertop. You can find all of the details and before pics here. 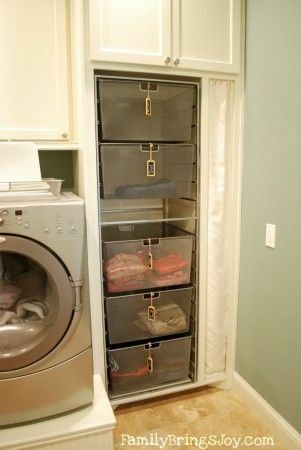 Front loaders allow for a counter on top, which is great for folding and storage. If you have a top-loader, have you considered adding a shelf? Each family member has their own basket – brilliant! Shelves are cleverly hidden with bamboo shades in this walkthrough laundry space. Although, maybe our mothers didn’t have it so bad. Pink Lady Kenmores! 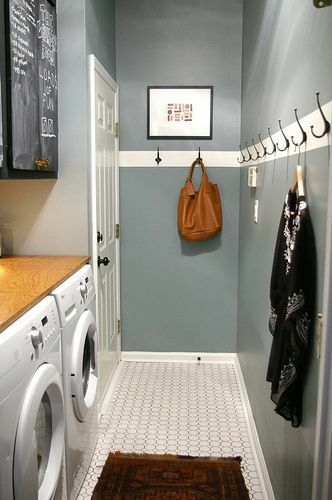 What could you do to spruce up your laundry room? 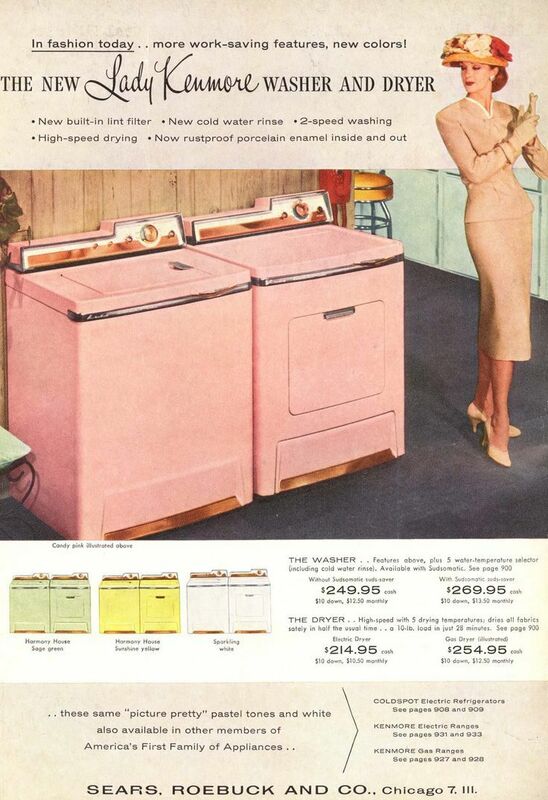 Aren’t we lucky that the laundry room has gotten more dressed up over the years and yet we can forgo the hat and heels? That’s what I call progress! Previous PostWe are 3! And a birthday before and after.